Last year this time, when the whole city was abuzz with the festivities of JIO MAMI, I wrote in exhaustive detail about the festival’s lack of inclusivity. How despite having some of the most vocal, powerful women at the forefront, the festival managed to include a paltry 28% of films directed/co-directed by a woman in their lineup. I dread to take a look at the numbers this year, but I have been made privy to far more disturbing news than that, and I believe, with all its power, MAMI can make it right. We can fight for inclusivity all we want, we can try and screen films made by women at these festivals and encourage female filmmakers endlessly, but what can one do when a woman slogs to make a film, only to have herself stripped of the rightful credits? Four-time National award-winning Lipika Singh Darai is not exactly in a dire need to prove her merit as a filmmaker, her films speak volumes about her directorial and technical prowess. Incidentally, her documentary film ‘Some Stories Around Witches’ is being screened in Chennai at the Social Justice Film Festival as the opening film today. 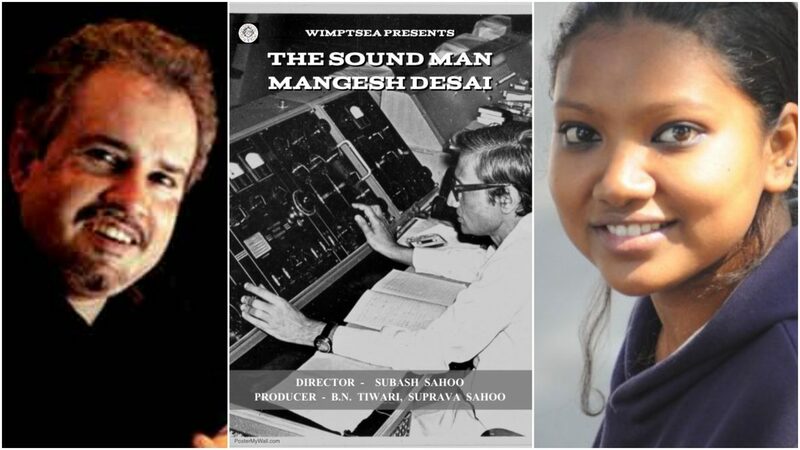 Yet, Subash Sahoo, the director, decided to keep all the glory and recognition to himself, after Lipika gave two years co-directing and editing the film ‘THE SOUND MAN MANGESH DESAI.’ This 113-minute long documentary of the legendary sound recordist Mangesh Desai is screening at Jio MAMI today under the ‘India Story’ section without due credits to Lipika as the co-director. In 2015, Lipika was asked to be the editor of the project by B.N Tiwari, the designated producer (President, WIMPTSEA*) and Subash Sahoo the Director (General Secretary, WIMPTSEA). Although the agreement was limited to her services as an Editor and a Researcher to aid the edit. Lipika was expected to go above and beyond the call of duty and she ended up co-directing the film. She was instrumental in creating the structure of the narrative for the film, she authored the narrative script, she was responsible for overseeing the shooting of the interviews and much more; all this in addition to her duties and responsibilities as an Editor. Lipika is from Odisha and the film was being shot and edited in Mumbai. So, spending from her own pocket, she rented an apartment and managed her living expenses in a city purely out of her love towards this project, and her admiration for Desai. Sahoo made a tepid 18-minute version of the film about Mangal Desai, that acted as a catalyst to make a longer film about the legend. The two-hour film, contrary to the one-hour version that was originally decided by Sahoo, had a larger canvas, required a larger vision, and a process which needed an immense amount of involvement. When asked about some of her contributions, Lipika said “Almost all the video clips and musical pieces have been carefully selected and interwoven by me to bring in the narrative we have, covering the legend’s massive body of work. The recreation of Foley work from one of his biggest achievements that were Sholay, and the comparison between the analogue and digital – between his era and the current era – has been conceptualized and the shoot supervised by me. Even the idea to use auteur Satyajit Ray’s testimony on Mangesh Desai through a narration by the filmmaker and to bring in their creative collaboration through carefully selected film sequences was conceived by me. For the person who redefined “silence” in films, a film about him would definitely demand to be in a space between sound and its silence. And that is what I have tried to achieve in this film. All these and many more such ideas which define the film that is conceptual in nature need directorial decision making, which was taken by me, supervised by me in the required reshoots that were carried out in the presence of Mr Sahoo and eventually approved by him.” I happened to catch some of the reviews and tried to see if Sahoo was able to give such nuanced insight about his own project. His quotes left a lot to be desired, unlike the way Lipika poured her heart out about having made it along with him. Having at first agreed to share the main credit, in a decision that was conveyed through his personal email, Sahoo allegedly denied any intention to share the main director’s title, in all his subsequent emails. Lipika said, eventually, WIMPTSEA, took out her initial co-director title too and was given only the Editor credit. It seems, WIPSTEA assumed any extra contribution could be expected from any crew member in a film like this, and because she has been paid she holds no right to question. They even denied all her requests for a meeting. Post which, she received an email from Sahoo that said “I will not be needing any further services from you for the film. Thank you for your services,” during the final stages of film completion. “In the conversation with WIMPTSEA, All they said, ‘we want to consider this a closed chapter hereon’. I wasn’t even allowed to do a final review, and do the finishing touches which I had visualized for the film. I haven’t yet seen the final film. The film, which I nurtured for such a long time and was deeply involved with. As a filmmaker, this has had the most deleterious effect on me. Being stressed for several months, I couldn’t fight for my ethical rights even to review my final film. Eventually I was blocked by the director in social media and have been kept completely away from any progress of the film,” Lipika said. “I am not denying the enthusiasm he had for the film, neither do I disrespect him as a film professional, as he could have made a different film out of it. Those in power effortlessly took a decision for their own benefit, but when asked to re-evaluate the creative directorial contribution, they floundered. It was easier for them to take off someone’s credit, rather than acknowledge the change in circumstances. It is well known to all of us in the filmmaking fraternity, how the potential of credits has been abused, and how rights of the creative professionals trampled upon,” detailed Lipika who is distraught and traumatised with the whole turn of events. An Association of Sound Technicians that is set up to protect the rights of the professionals instead decided to keep passing the buck. Sahoo would allegedly keep deflecting that he doesn’t have the powers to intervene, only the producers (WIMPTEA) do. He is not just one of the producers, he is the General Secretary of WIMPTEA – the very organisation that claims to have ultimate power over the project – but he squarely refused to discuss this any further with Lipika. Along with the pervasive and repugnant scourge that is workplace sexual harassment, equal opportunity, equal representation and protection of intellectual property rights are some of the things women have constantly had to fight for. The legal notice that Lipika has since sent to Sahoo doesn’t demand any monetary compensation; it allegedly tries to put forward her position as a film professional and to get back the regard as an individual, which has been by clearly compromised by WIMPTSEA and Sahoo. She has also written to the directors of MAMI to intervene in this issue, and make things right, and is awaiting their response. MAMI is no stranger to making rightful amends to their lineup. Only recently, Ere Gowda’s feature-length film, ‘Balekempa’ was withdrawn from the festival due to the allegations of sexual harassment against the director. This is the sort of ethical stand people from the fraternity are expected to take. In the era of #MeToo when women are fighting for their voices to be heard, it is imperative that we look at this issue holistically. Along with the pervasive and repugnant scourge that is workplace sexual harassment, equal opportunity, equal representation and protection of intellectual property rights are some of the things women have constantly had to fight for. In a country like India, the victims in media stand very little chance in winning an IP/credit battle because of ambiguity with which the law is designed, so the odds are stacked against us as it is. When people exploit their positions of power by unfairly denying credit when due, how would filmmakers feel motivated to pursue their dreams in this already tabooed industry? There is also a disturbing ambiguity about the position of a “co-director” in the industry that’s driven by the producers. They guard the project like a fortress and control the rights of the film. Often, it can be observed that the co-directors’ name is forgettable unless it is credited along with the director, and we have had many such instances where a writer/creative consultant has worked towards the project’s fruition but would never hear from the producers again too.